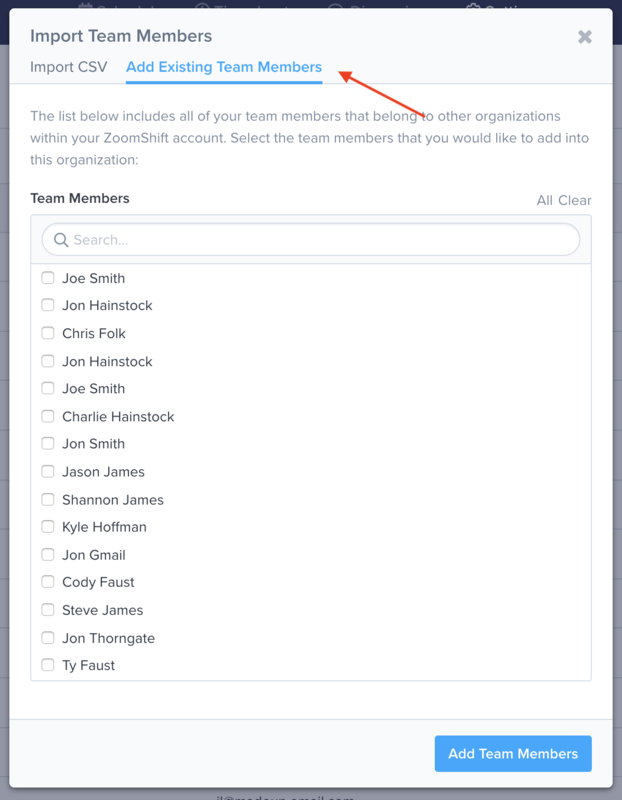 If you have more than just a few team members, you probably don't want to add all of them manually into ZoomShift. This help guide will show you how to add your team members quickly. 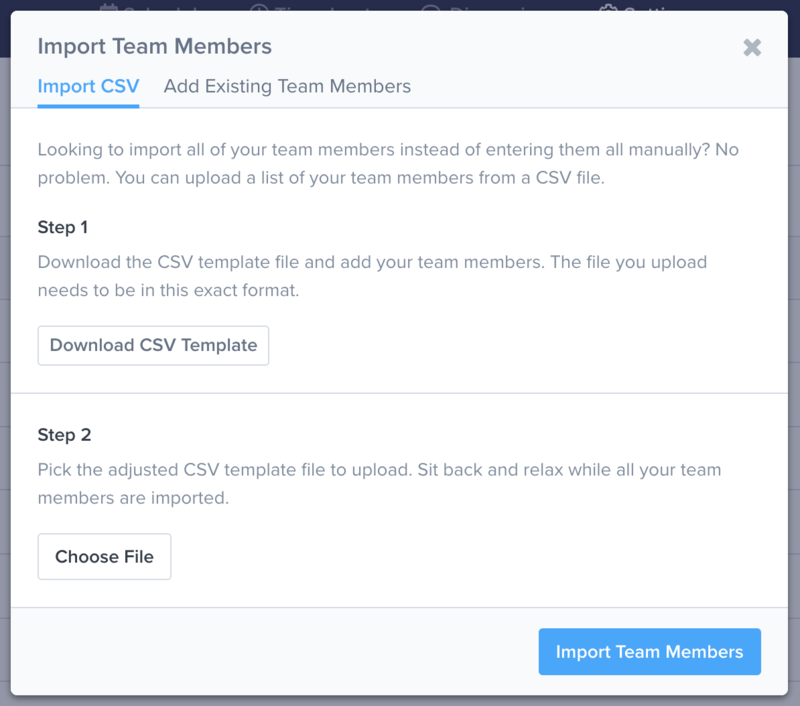 The most common way to add a large number of team members is to import them via a CSV file. 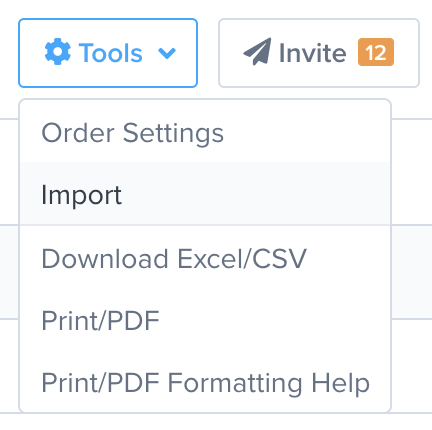 To do this, go to the Settings => Team Members page, click on the Tools dropdown, and select Import. You will see a pop-up like the one below. Before you can upload your team, you need to create a CSV file that is formatted correctly. You can do this by downloading the CSV template file and then adding your team to the file. After saving the file you can then upload it using the Choose File button. If the file is formatted correctly and the data does not have any errors, all of your team members will be imported! You can’t import more than 100 team members at a time. If you have more than 100 team members you will need to import them in batches. The file must be in CSV format. The file you upload must be in CSV format and not an excel file or other spreadsheet software. Make sure when saving the file you select the CSV format and the file has a .csv extension. If an email or mobile number is invalid you will see an error message. If a Time Clock PIN is used more than once, this will cause an error. Note: If an error occurs, the entire import is canceled. If you have any trouble importing users, don't hesitate to contact support. If your account has multiple organizations, you can import team members from other organizations. If you have team members that need to belong to multiple organizations this is the best way to accomplish this. Then select the Add Existing Team Members tab. You should see a form like the one below. Select the team members you would like to import and click the Add Team Members button. Once added, your team members can switch between organizations. To jump between organizations, click on the name of the organization in the top left corner and you will see a pop-out with the organizations you belong to.